Who ordered fish with lasers? Before you get blasted, bring the thunder, and you might just shock their gills off. Who ordered fish with lasers? They attack relentlessly, but a jolt of thunder will make them jump right out of their scales. 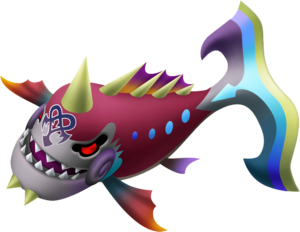 The Fin Fatale is a Dream Eater that appears in Kingdom Hearts 3D: Dream Drop Distance. The Fin Fatale is a piranha-like Dream Eater. The Fin Fatale's name is a pun on the phrase "femme fatale", which is French for "deadly woman". "Fin" refers to the Dream Eater's ichthyic appearance, while "fatale" refers to its dangerous nature. Its Japanese name literally translates to "torpedo fish" (魚雷魚, gyoraigyo?). As a Spirit, it has a yellow face and jaw, black eyes with yellow pupils, an orange tongue and a green mouth filled with many sharp teeth. The Spirit Dream Eater symbol is located between its eyes, and on both sides of its jaw are green spiral-like formations. It has two small, white horns jutting out under its jaw, and a large horn in the center of its forehead. Its body is primarily a purple color, with four yellow spots running along each side. Along its back is a fin consisting of four more horns with blue and purple ridges between them. Its front fins flow from blue to dark blue to purple, and it has two smaller light blue fins towards the back. Its large, blade-like tail fin has red, lime, and blue stripes. As a Nightmare, it has a grey face and jaw, red eyes, and a dark pink mouth filled with many sharp teeth. 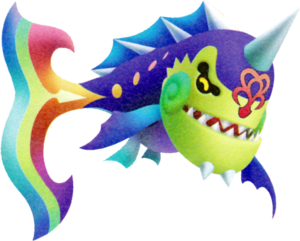 The Nightmare Dream Eater symbol is located between its eyes, and on both sides of its jaw are purple spiral-like formations. It has two small, off-white horns jutting out under its jaw, and a large horn in the center of its forehead. Its body is primarily a maroon color, with four blue spots running along each side. Along its back is a fin consisting of four more horns with orange and purple ridges between them. Its front fins flow from dark blue to red to orange, and it has two smaller black and purple fins towards the back. Its large, blade-like tail fin has dark purple, light blue, and pale yellow stripes. ↑ 1.0 1.1 Becomes available when in Grunt disposition. ↑ 2.0 2.1 2.2 2.3 Becomes available after unlocking Secret: Green at B-5. ↑ 3.0 3.1 Becomes available when in Diver disposition. The Fin Fatale Recipe can be purchased from the Moogle Shop for 30 munny once La Cité des Cloches has been entered. The Fin Fatale can be created through six different recipes. This page was last edited on 31 March 2019, at 10:57.